Scandinavian three legged teak stools designed by Hugo Frandsen for Spottrup, Denmark. Original black vinyl upholstery, labeled. Carl Malmsten stool simple but elegant hand made craftsmanship with signature leg construction, Sweden. Hans Wegner teak and cane stool or bench for Johannes Hanse, Denmark. Restored caning which color match over time. Rare Sergio Rodrigues "Mocho" stool for Oca, Brazil, 1954. Sublime in its simplicity and comfort, in very good original condition, stamped. 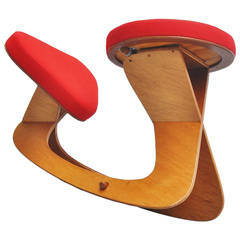 Hans Wegner design stool model JH539 made of sculpted teak with a cabe seat, labeled. In excellent original condition, with two small breaks that have since been repaired.